Amy Ruiz Fritz August 25, 2012 August 25, 2012 3 Comments on You want me to put that where? Am I the only one who does this? I had put my PJs/Hosiery in the bottom drawer, but it just didn’t feel right, so I rearranged the drawer placement. It seems like I arrange my clothes by weight. The heavier stuff goes on the bottom and becomes lighter and the drawers go up. Of course, frequency can be a reason to place things in a certain way, but I’m pretty sure I access each drawer every day the same amount of times or pretty close to the same amount of times. It’s pretty arbitrary as to where my clothes are placed and how they are grouped, but this is what makes me feel comfortable. If I put my foundations in with my skirts, that would just seem weird even though, I usually have to wear one with the other. Nope, you’re not the only one. 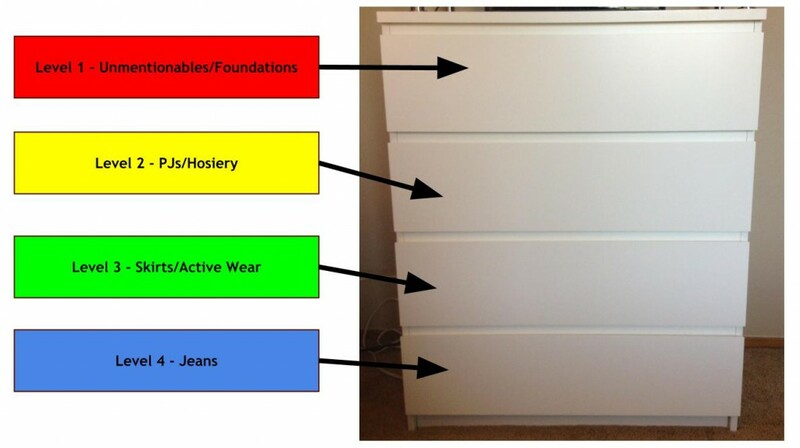 When I still used a dresser I had basically the same setup, except drawer 3 was for t-shirts & tops that didn’t require hanging, drawer 4 was for sweaters, and drawer 5 was for exercise clothes & sweats. Now I’m using 6 square softsided bins that fit perfectly in the shelving in my closet for undies, socks, sleepwear, exercise clothes, t-shirts, and tank tops. Everything else is on clothes hangers. And I’ll bet the heavier stuff is on the bottom! It’s just so random how we do things like that. Had to think about it for a second, but yes, the 3 heavier ones are on the middle shelf (bottom is the floor so shoes are there, which still counts as heavy, I suppose).